With Intel set to unveil its 8th-gen Core processor lineup in a few days and the IFA technology trade show coming up at the end of the month, you can probably expect to see PC makers announce a whole bunch of new and updated laptop and desktop computers in the coming days. 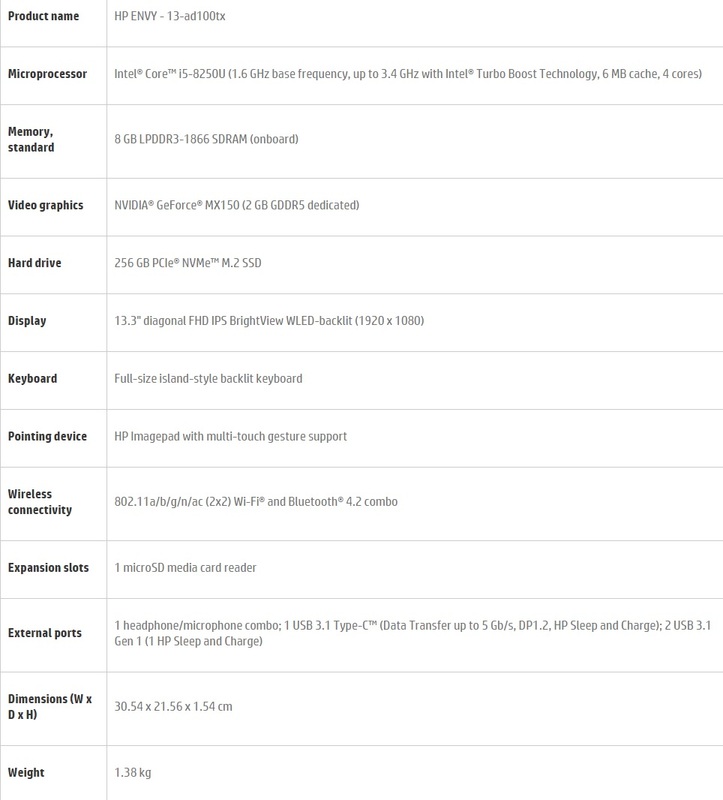 Case in point: HP has new configurations for its Envy 13 notebook on the way. How do I know? Because a service manual for the Envy 13 hosted on HP’s website tells me (and because @przemyslis told me about the manual). It looks like this is a refresh to HP’s existing Envy 13 rather than a brand new model, which makes sense since the company just updated this laptop a few months ago. But any new Envy 13 laptops with a model number between 13-ad100 and 13-ad199 will feature an 8th-gen Intel Core “Coffee Lake” processor. Intel Core i7-8550U with 1.8 GHz base and 4 GHz turbo speeds. Interestingly, HP describes these chips as dual-core processors, which I’m pretty sure is a mistake. As far as I’m aware, both of those processors will actually be quad-core chips with support for hyperthreading, giving you support for up to 8 threads. Update: And HP’s service manual for a new Pavilion x360 convertible laptop with a 14 inch display with the same processor options describes them both as quad-core chips. The HP Envy 13 is expected to be available with full HD and 4K display options, support for up to 16B of RAM, and up to 1TM of storage on some models. Other features include two USB 3.x ports a USB Type-C port, a backlit keyboard, and an optional “SecurePad” touchpad with an integrated fingerprint scanner. At least one model also features NVIDIA GeForce MX150 graphics. Need two f’s in coffee. The page now says “404 Page Not Found”. How many arms and legs do you want for this, HP ?